In the Cambridge Men’s Trial Eights, Listo on the left and Fuerte on the right approach Harrods. Following the HTBS report on the intra-university races of the Oxford-Cambridge Women’s Boat Race Trials on 10 December, here is Chris Dodd’s reports on the men’s trials that were run on 13 December. 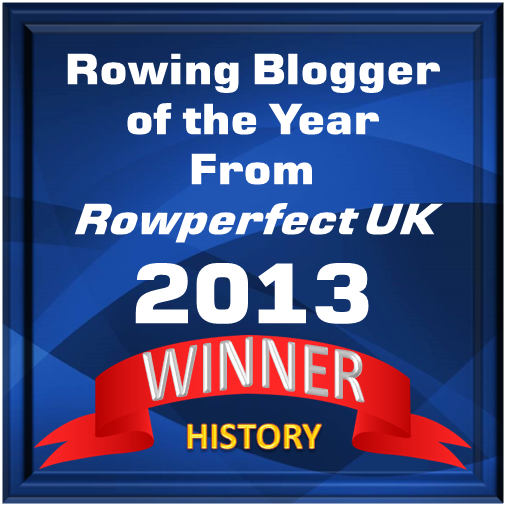 As Chris has witnessed more than 40 University Boat Races from the press launch, his views are always worth having. Tim Koch took the pictures from the bridge and from the Middlesex bank at Hammersmith. Intersport photographer Peter Spurrier followed the race and his pictures can be viewed on his website. Cox and Box? See here. 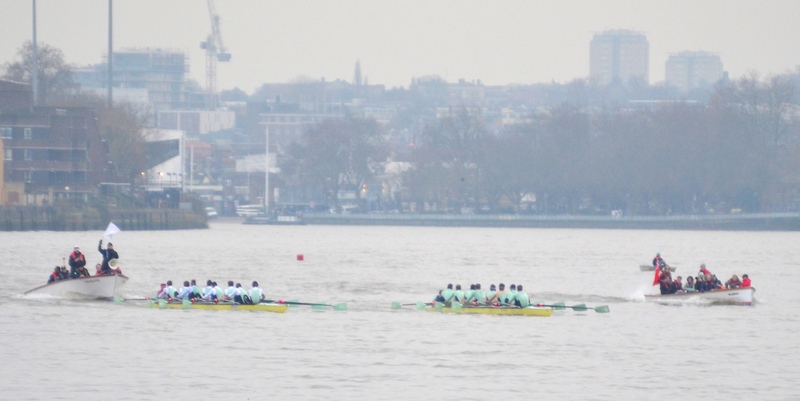 A grey day of trials for the 2016 Boat Race was lightened up by good racing and earns a footnote in history for the timely words of umpire Simon Harris. When the cox of the losing Cambridge trial boat raised his arm at the end of the race, Harris heard that the grounds for Hugo Ramambason’s appeal were that his cox box had ceased to work a minute into the action. Umpire Harris deemed that this was no ground, and therefore no appeal. Thus we were delivered of a new Boat Race folly – that a defunct cox box constitutes an equipment breakage. Ramambason took it badly, taking his feelings out with his fists on the Tideway. Checking equipment before going afloat might be an idea. Approaching Hammersmith Bridge, Furte leads Listo. After the mile Fuerte moved a lot until Luke Juckett at 7 crabbed, causing his crew to flay about for a couple of strokes. From the press launch it looked like a clash, but we are assured it wasn’t. Listo went ahead by about two thirds of a length but were caught by Fuerte before Hammersmith Bridge. Fuerte, who had attracted three warnings to Listo’s one passing Harrods, had a canvas before the bridge and half a length after it. They maintained a length lead round the Surrey bend. They extended this after the Crossing in a brief period of line astern and reached the finish about two and a half lengths in front. Listo continued to row well. There was no sense of let-up. It’s a pity that Ramambason clouded the mood. The Cambridge race shoots Hammersmith Bridge. An hour and a quarter beforehand, Oxford’s Business and Pleasure started. Pleasure, stroked by Jørgen Tveit and coxed by Sam Collier on the Middlesex station, took an immediate lead that they extended to about a length at the Mile, both crews having settled at 34. Collier was warned several times either side of the Mile Post by Harris for his attempt to bore Business off the tide. 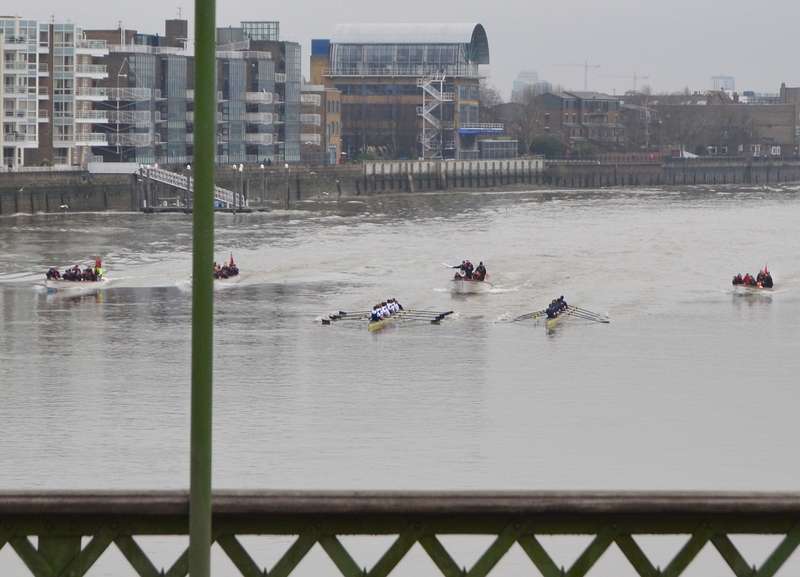 As the Oxford trial approaches Hammersmith Bridge, Pleasure (left) leads Business (right). 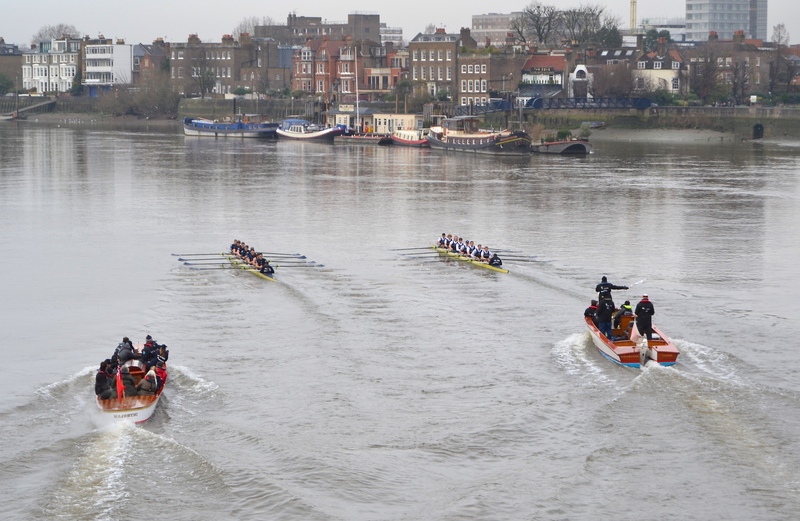 Business, coxed by Olivia Cleary and stroked by Nik Hazell, remained unfazed and reduced their deficit by half a length before reaching Hammersmith Bridge. With the advantage of the bend they continued to push as they passed St Paul’s boathouse while maintaining an efficient rhythm. But at the foot of Chiswick Eyot they softened for a while, allowing Pleasure to sit steadily on a three-quarter length lead. Upstream of Hammersmith Bridge, Pleasure continues to lead. At Barnes Bridge, Pleasure had about a length and, tailed by Business, who had the best water, went on to win by about 2.5 seconds. Both coaches – Cambridge’s Steve Trapmore and Oxford’s Sean Bowden – will take positive messages from the performance of their crews. For what it’s worth at this early stage, Cambridge look the stronger squad in both senses, but as always with these canny coaches, it’s too soon to risk money. Thanks to Chris for this report. The official Boat Race website reports are also online, click here for Oxford and here for Cambridge. On Twitter, ‘Fatsculler’ (a.k.a. 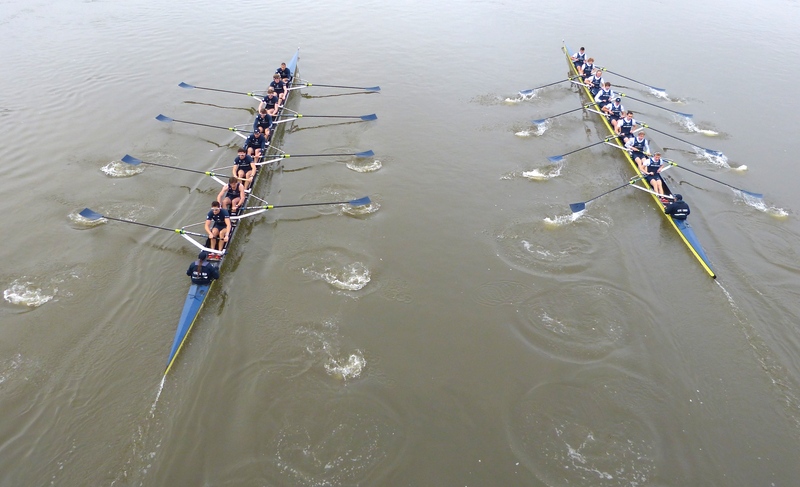 Daniel Spring) wrote: #trial8s shows @CUBCsquad have stronger top end, but @OUBCsquad have more strength in depth. Makings of a great contest.